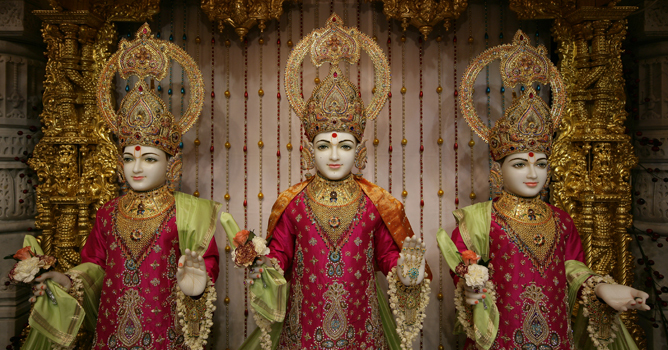 Between the first and second artis in the morning, the Deities are dressed and adorned. This is an important aspect of attending to the murtis, called shangar (pronounced ‘shangaar’). With God often conceived in Hinduism as a king reigning supreme over his creation, devotees wish that he appears before them in regal finery. 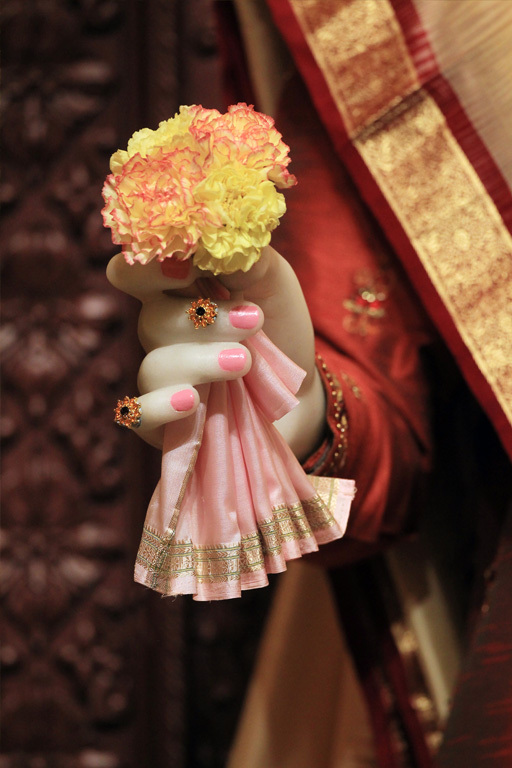 The garments and adornments offered to him and his accompanying divinities therefore often appear majestic. A range of different types of clothing in assorted colours and with various accessorial articles means that the shangar is varied daily and darshan of the murtis is never quite always the same. Some of the many different types of adornments available for offering include those for the head, ears, neck, waist, arms, wrists, palms, fingers, ankles and feet. 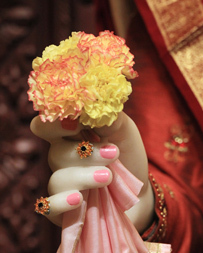 Other shangar offerings include devoutly prepared fresh garlands and posies (small bouquets). The shrines are also embellished with fresh flowers brought in by worshippers as well as intricate backdrops and other ornamentation. Festivals and days of religious observance – such as Ekadashi or Punam – are occasions for special adornment and offerings, while there is also accommodation for seasonal variation; for example, warm clothing is offered during winter months, but lighter garments during the summer. Much of attending to the Deities in this way is ordained by ancient Hindu liturgical texts such as the Panchratra Samhitas. Sadhus (Hindu monks) serving as pujaris (attendants to the Deities) are trained in the finest of details, which they eventually master after much practical and spiritual practice. Above all, it demands the devotion and appreciation of the living presence of God within the images.